2.1 Is moringa suitable to make us lose weight? 2.2 Why is moringa suitable for weight loss? Is moringa suitable to make us lose weight? Moringa contains a number of properties that make it very suitable in a slimming diet. To achieve its effects it is best to eat the leaves, raw or cooked or to mix the powder of dry leaves in purees, soups, etc. There are also moringa supplements in the form of capsules or tablets. They are for sale in pharmacies or natural products stores and they serve the same purpose. This type of product is useful for those who can not access the fresh leaves. Moringa supplements are an alternative to protein shakes that are commonly used in lose weight diets. They are also used by athletes and bodybuilders to regain muscle or increase muscle mass. Although all these supplements are very fashionable, it is better to use the plant as food than to resort to moringa supplements. Why is moringa suitable for weight loss? Moringa is very rich in fiber, especially dried moringa leaves containing up to almost 1% of its fiber content. This fiber, on the one hand, provides a great feeling of satiety, which is very suitable for not feeling hungry and have to resort to “snacking between meals”, an occasion for people to eat generally sweet and not recommended food for people who want to lose weight. On the other hand the fiber of moringa, of soluble nature, forms in the intestine a gel, when it combines with water. In this gel, part of the fats are trapped, which reduces their absorption, facilitating at the same time their expulsion to the outside through the feces. The high fiber content, combined with the moderate fat content of the leaves, makes them a “vegetable” very suitable for slimming diets. Moringa contains many proteins, carbohydrates, vitamins and minerals. Generally, when we feel the need to eat some unpleasant whim (sweets, ice creams, pastas, chocolates, etc. ), it is because there is some empty in the body in some nutrient. So, for example, it is believed that when we feel the need to take a fruit juice, it is because we need vitamin C.
Moringa is so rich in nutrients that it can cover the organic needs of some nutrients, which eliminates the urgency to eat some type of “junk food”. For example, 100 g of moringa provide 40% of the required daily proteins. One of the causes of weight gain is fluid retention or edema formation. For various reasons (problems in the kidneys, heart, little contribution of liquids, etc.) the organism tends to retain water, with which it increases the corporal volume and weight. Moringa is a diuretic plant, capable of favoring the elimination of liquids through the urine. This eliminates toxins but also decreases the volume and body weight. 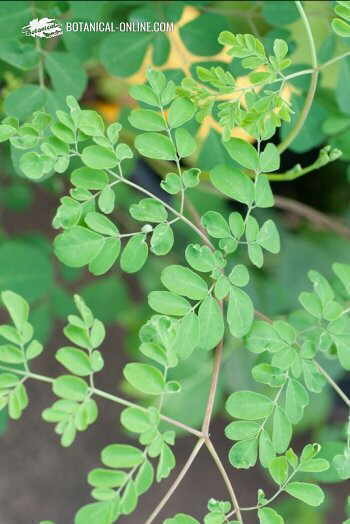 Moringa is rich in glucosinolates. These are converted into isocyanates components with depurative properties of the liver. A liver in better conditions helps to better metabolize fats. On the other hand, moringa is rich in vitamins of the group B. Vitamin B, among other functions, helps to burn the food to produce energy, reason why it stimulates the metabolism.